Finally the spring is here! 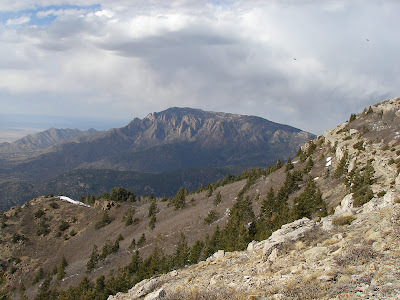 Hubby and I enjoyed a great hike to the top of the Sandia mountains on Sunday. This is only the second time we’ve made it to the top! (Actually, we made it to the top of the south crest, north crest is still a ways further!) It was four hours to the top and 2 1/2 hours back down. The weather was perfect, except for a little sprinkle of rain in the last half hour. I took a video of the 360 degree view from the top, but I haven’t been able to figure out how to transfer the video to youtube yet. Help, anyone?? Until I get it figured out, I’m posting a still photo from the top looking north. There is still a good 3 feet of snow at the top in spots! Also, today I finished this daily journal painting. 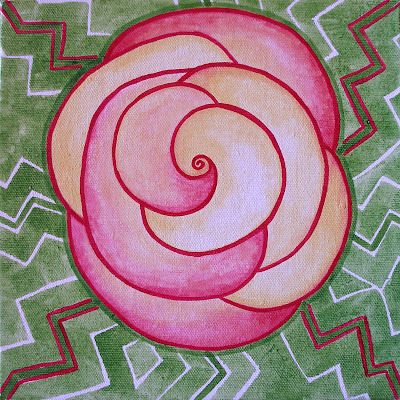 It was inspired by a blossom on one of my hubby’s cactus. Very cool flower! Once again, an 8 x 8″ H2O oils on recycled handmade canvas board.